But a Republican win offers by far the more likely prospects for immediate Keynesian stimulus, partly because Democrats in Congress have shown no taste for the kind of economic sabotage that the Republican caucus has engaged in. In other words, the Democrats will never match the Republicans in terms of their Rules of Engagement. When Republicans openly admit that their top goal is to defeat the president and engage in voter suppression to accomplish their goals, it becomes clear to me that their endgame is winning, not helping the American people. This is a war that the Democrats don’t have the stomach to win, because for all their faults, missed promises, and outright lies, there is a level that they won’t stoop to. When we talk about bipartisan support in the last decade, it is Democrats who have supported Republicans, for better or worse, on the Iraq and Afghanistan wars, TARP, campaign finance, and more. In return, the Democrats get stonewalled by Republicans who are fearful of unelected personalities like Grover Norquist and Rush Limbaugh. This is smart for the GOP if the goal is winning. Consciously or subconsciously, either we vote for Democrats who won’t get anything done, or vote for Republicans who will have the ability to get stuff done. That stuff is likely to include many of the ideas that Democrats have been pushing, or something completely different- there is no way to know for sure. Either way, we can be sure the Republicans will take credit for any success they have. If that success is best for the American people, is it worth the cost of voting for the GOP? A prototype of an unreleased model? No, a bad repair job. This is a Lexus RX 400h, a relatively recent and high end hybrid SUV, which has clearly been rear ended and repaired because the badges have been incorrectly applied by the body shop. 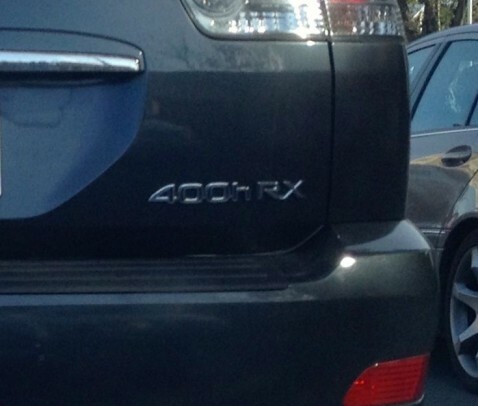 The badge should read “RX 400h”, instead of “400h RX”. This happens more often than you’d think, and is a sign of poor attention to detail. This hapless Lexus driver paid real money to rewrite their car’s history, only to have a poor repair job signal to the world that this car has been wrecked. This is a particularly egregious example, but I’ve seen more subtle but telltale reminders of repaired rear ends, like badges applied to the wrong side of the car, poorly aligned badges, and even the wrong model designation. If you ever get rear ended, make sure you have pictures of the badges before the accident, or do a Google Image Search to find the official photography showing the exact badge placement. If the car comes back with the badges in the wrong place, make the body shop fix the problem- it’s a simple matter for them to move things around. You or your insurance company paid good money to get your car repaired properly, and a poor badge job just makes baby Nick cry.